Griechenland und Kleinasien vom XIten bis in die Mitte des XIIIten Jhdts. 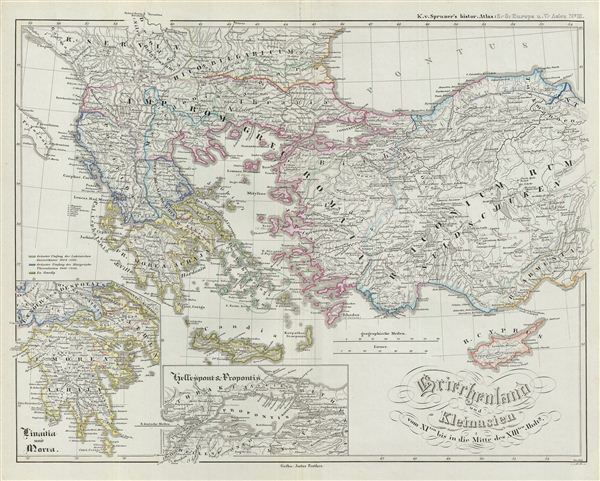 This is Karl von Spruner's 1854 historical map of Greece and Asia Minor (Turkey) from the 11th to the mid-13th century. The map coves Greece and Turkey from Bulgaria in the north to Crete and Cyprus in the south and as far as Armenia in the east. Two inset maps on the lower left corner detail Livadia and Morea, and Hellespont and Propontis (Sea of Marmara and Bosporus). The period between the 11th and the mid-13th century marked a sharp decline of Byzantine hegemony in the region. After a majority of Asia Minor, the heartland of the empire, was lost to the Turks in 1071, the Byzantine Komnenos Dynasty managed to maintain the empire until 1181. Following the 1180 the death of emperor Andronikos I Komnenos and another period of decline, the Fourth Crusade (1204) divided the empire into Greek and Latin states. Constantinople was eventually recovered by the Palaiologoi Dynasty, but ultimately fell to the Ottomans in 1453, marking the formal end of the Byzantine empire. This map is rendered in finely engraved detail exhibiting throughout the fine craftsmanship of the Perthes firm. Prepared by Karl Spruner for publication as plate SO III in the second edition of Justus Perthes' 1854 Historich-Geographischer, Hand-Atlas zur Geschichte der Staaten europa's vom Anfang des Mittelalters bis auf die Neueste Zeit.